Scanning and sending documents just got easier than ever. As a standalone scanner connecting to a network via ethernet/wireless, the 915i is an ideal solution for colleagues in offices to share a scanner. No cable required, just a wireless connection. No computer needed. Just walk up and scan your document to email, the cloud, USB drive, your mobile device or wirelessly to your computer. Just touch the button. If you are looking for an Ambir or Docketport scanner model that works with Athena, Omnitracs or Innsoft software products, this product is NOT compatible. 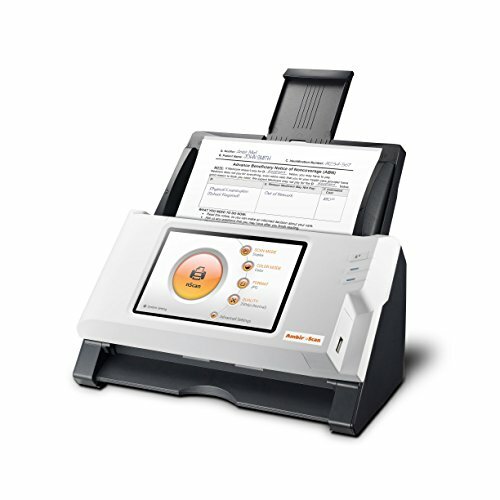 Please contact an Omnitracs or Innsoft authorized reseller to purchase the scanner you need. Athena customers may contact Ambir Customer Service at 630-530-5400, option 1. No computer, no drivers, no cables needed: As a standalone scanner connecting to a network via ethernet/wireless, the 915i is an ideal solution for colleagues in offices to share a scanner. No cable required, just a wireless connection. Note, model NS915i is not compatible with Athena, Omnitracs or Innsoft software products. More Options: With every scan you can easily deliver your document to any of the following: email, network share (SMB), online storage, mobile and tablet devices, PC or Mac, and USB drive. More Functional: nScan's ability to handle multiple users makes it ideal for groups, as the settings are easily modified through the touch screen." More Advanced: Engineered to perform flawlessly, with an advanced color touch panel display and a 3,000+ day duty cycle this scanner is in a class it of it own vs. competitive alternatives.